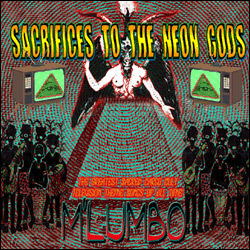 "Sacrifices to the Neon Gods"
A homage to popular TV features of by-gone eras, including the themes from The Flinstones, The Addams Family, Hawaii 5-O, The Jeffersons, Perry Mason, Alfred Hitchcock Hour, and I Dream of Jeanie, not forgetting the many James Bond themes. All performed like some colonial era African Jazz Orchestra with a strong interest in the Avant-Garde who had their drinks spiked with hallucinogenics. None of these versions have been previously released, although a few were on early '90s cassettes.